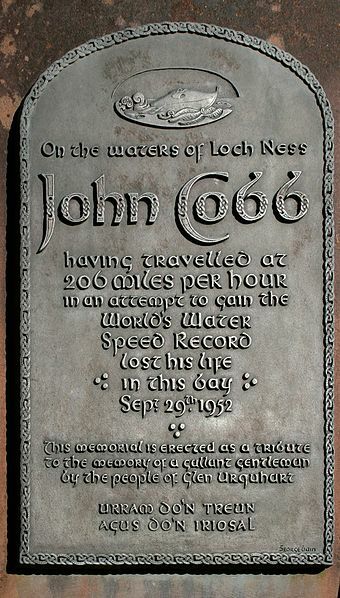 The Inverness Courier notes the gathering today of speed enthusiasts to mark the death of world land and water speed record holder, John Cobb at Loch Ness. On that day of the 29th September 1952, the 52 year old had exceeded the record with a speed of 206mph. However, before the second mile run which would have established the record, the boat broke up on hitting a wave and Cobb was killed. The events of those days are shown on this YouTube video. The memorial cairn at which these people gather today has a simple plaque but it speaks of the bravery and determination of the man who pushed the boundaries of speed. Between 2000 and 2002, the Loch Ness Project team and other experts managed to find the debris field of the boat at a depth of 200m (picture below from BBC). However, unlike the Wellington Bomber that was recovered from Loch Ness, I am not aware of any attempts to recover the remains of the Crusader. The Crusader had hit an unexpected wake which led some to ask a single question. The fact was that there should have been no wakes to disrupt and endanger the boat. The loch would have been cleared of boat traffic and Cobb would have had as calm as surface as possible. Hence the word "unexpected" applied to the rogue wake. But is "unexpected" the same as "unexplained"? The single question asked was whether the Loch Ness Monster had moved just beneath the surface and produced the deadly wave? 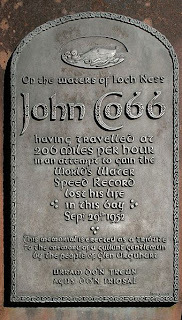 He claimed that John Cobb, who was killed while attempting a new water-speed record on Loch Ness, “was killed by Nessie”. Tim explained that when a water speed attempt is made on a loch (or lake), it is necessary for all craft, of whatever size, to be stopped. This is because the “line wake” of a craft is sufficient to upset the speed boat. What is required is what is known as a “Jelly calm”. We knew that Movietonews had a shot of the disaster that befell John Cobb. It had been shot on 35mm film and showed the speed boat taking off just like a seaplane before it somersaulted and crashed back into the water. I had the film step-printed to enable us to show, in slow motion, the very definite line wake and the bouncing of John Cobb’s boat when it arrived at the line wake. This matter has never been resolved and it requires an answer. One of this article's comments below pointed me to Tim's book "The Leviathans" ("Monster Hunt" in the USA). In this we read Tim's full investigation into the matter following a discussion with another Nessie hunter, Torquil MacLeod. You can refer to the book for further details of what Tim thought. Clearly, if one believes there is one or more large animals in Loch Ness, then it is a possibility. However, what can be gained from following this line of enquiry is uncertain. Nicholas Witchell, in his book "The Loch Ness Story" suggests the reflection of the Crusader's previous bow wave was to blame but the Courier article linked above says the crash occurred at the end of the first run before such a wave became an issue. In that light, the aforementioned Loch Ness Project team suggest one of Cobb's support boats was to blame. That is also possible though how one proves it is another question. Perhaps, it is best just to leave this minor mystery alone as it is the kind of Nessie headline that seems undesirable. To that end, we leave you with a photo of the man himself on that fateful day and again we recognise the bravery and determination that marked him out from others.